Ingredients when reconstituted: potato (87%)[contains emulsifier (471), perservative (220)], whey, skim milk, sunflower oil, salt, flavours (contain milk derivative), cream, spice extracts. Allergens:Contains Milk & Preservative (220).Manufactured on equipment that also processes products containing wheat, soybean, egg, peanut, sesame, fish and crustacea. 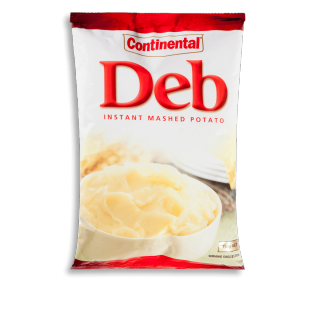 Pour boiling water into a bowl and stir in Deb Instant Mashed Potato (see quantities below). Allow to stand for 30 seconds; stir again. Serves DEB Boiling Water Aprox. amount mashed potato 1 1/2 cup 2/3 cup (170mL) 190g 3 Whole packet 2 cups (500mL) 560g For fimer mashed potato, use less water. For softer mashed potato, use more water. For creamier mashed potato, substitute hot milk for up to half of the water and add 1-2 tablespoons margarine or butter. Freshly ground pepper may also be added if desired.